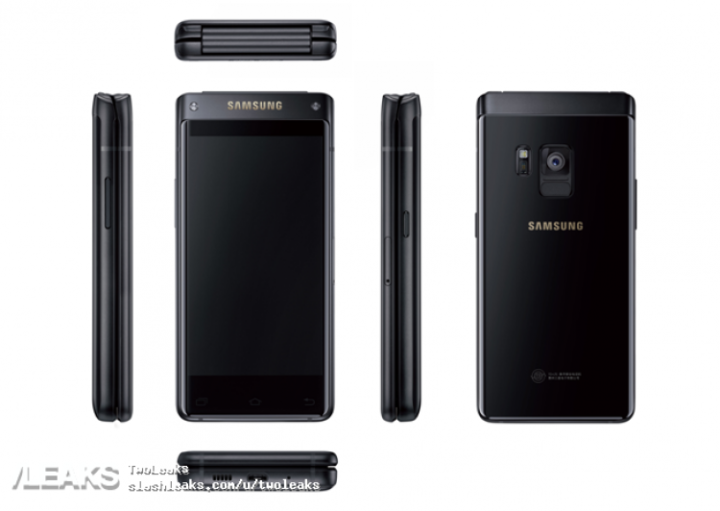 After passing China's TENAA, WFA, and the US FCC, Samsung's upcoming high-end flip phone has now leaked in a render. The image that has surfaced not only focuses on the front and back, but sides as well. The design this leaked image reveals is inline with what we've seen at TENAA and the FCC. According to information revealed by the Chinese agency, the device - which carries a model number of SM-G9298 - is powered by Snapdragon 821AB chipset, and sports 4.2-inch 1080p screens. RAM is 4GB, while internal memory is 64GB. The phone - which was previously referred to as the W2018 - features a 12MP rear camera and a 5MP front shooter. It runs Android 6.0 Marshmallow, and packs in a 2,300mAh battery. It's also worth mentioning that a tipster recently said the phone will come with Snapdragon 835 SoC and 6GB RAM instead. The handset is going to support Samsung Pay and wireless charging, and will also feature S Voice. It is expected to be made official sometime in August, with China getting it first. Only need half of this phone, anyone want to share ? Finally Flip Phone comes in market thanks to launch Samsung Flip Phone SM-G9298. I want this flip phone. How can i buy it?